Cooperative businesses are community-owned private enterprises that combine consumers with owners, and buyers with sellers in a democratic governance structure. Cooperatives solve the general economic problem of under or over production, business uncertainty, and excessive costs. Cooperatives address market failure and fill gaps that other private businesses ignore; such as: provision of rural electricity or other utilities in sparsely populated areas, provision of affordable healthy and organic foods; and access to affordable credit and banking services, to affordable housing, to quality affordable child or elder care, to markets for culturally sensitive goods and arts. Cooperative businesses have lower failure rates than traditional corporations and small businesses, after the first year of startup, and after 5 years in business. About 10% of cooperatives fail after the first year while 60-80% of traditional businesses fail after the first year. After 5 years, 90% of cooperatives are still in business, while only 3 - 5% of traditional businesses are still operating after 5 years. This is often because of the many people involved in starting a cooperative and the high level of community support for cooperatives (World Council of Credit Unions study in Williams 2007). Cooperative businesses stabilize communities because they are community-based business anchors; and distribute, recycle, and multiply local expertise and capital within a community. They pool limited resources to achieve a critical mass. They enable their owners to generate income, and jobs, and accumulate assets; provide affordable, quality goods and services; and develop human and social capital, as well as economic independence (Gordon Nembhard 2002, 2004b, 2008a, 2014; Fairbairn et al 1991; Logue and Yates 2005; WAGES no date; Yes! Magazine 2013). In addition, co-op enterprises and their members pay taxes, and are good citizens by giving donations to their communities, paying their employees fairly, and using sustainable practices (Gordon Nembhard 2013; Iowa Association of Electrical Co-ops. 2011). Specific examples of benefits from cooperatives include: Food co-ops spend more revenues locally, buy more products locally, buy more organic produce, recycle more plastic, and create more jobs than conventional grocers. For every $1,000 spent at a food co-op, $1,606 goes to the local economy; for every $1 million in sales, 9.3 jobs are created (Yes! Magazine 2013). Credit unions approve more mortgages for low-to moderate income households, have lower denial rates for all nonwhites, and have lower loan delinquencies while doing more lending than commercial banks during the great recession (Yes! Magazine 2013). WAGES - the organization in California that develops women's ecological cleaning worker cooperatives - has found that before working in and owning the house cleaning co-op Latina's had a median income of $24,000; but after owning the co-op their median income is over $40,000 where the national median income for Latino households is only $38,000. So ownership in the co-op has put their income higher than the national average for their ethnic group (WAGES no date). Policy recommendations include: increasing awareness of and information about cooperatives among the general public and government agencies and employees; expanded, less restrictive, and more uniform co-op laws (at state and federal levels); enabling laws and supportive infrastructure, particularly for startup, capitalization, and financing (at all levels), including loan funds, small business services, and workforce funding dedicated to cooperative development. States which have stronger laws in support of cooperatives, and that have more cooperatives, experience more of the benefits from cooperatives. There have been some efforts to quantify impacts of cooperatives on communities, states, and nationally, using input-output models and standard economic analysis. Nationally, Deller et al (2009) report on 30,000 cooperatives operating in 73,000 locations with total assets over $2 trillion. They estimate that these cooperatives’ contribution to the state total income is $154 billion. These cooperatives have also helped to create over 2.1 million jobs, with an impact on wages and salaries estimated at almost $75 billion. Total revenues are almost $653 billion. According to the University of Wisconsin Center for Cooperatives (2012 Research on the Economic Impact of Cooperatives), Mississippi has a total of 875 cooperatives - the majority of which are water/waste cooperatives and the second largest sector is credit unions. These cooperatives have a total of 2.25 million members with 6,410 jobs created. Total revenues, and wages and salaries created by the cooperatives in the state are $4.6 billion, and $222 million, respectively. According to the University of Wisconsin Center for Cooperatives, Louisiana has a total of 324 cooperatives, the majority of which are credit unions. These cooperatives have a total of 1.5 million members with 8,450 jobs created. Total revenues, and wages and salaries created by the cooperatives in the state are $ 2.5 billion and $316 million, respectively. According to the University of Wisconsin Center for Cooperatives, Alabama has a total of 256 cooperatives with the majority being credit unions. These cooperatives have a total of 2.18 million members with 10,770 jobs created. Total revenues, and wages and salaries created by the cooperatives in the state are $4.29 billion and $373 million, respectively. According to the University of Wisconsin Center for Cooperatives, Florida has a total of 850 cooperatives with the majority being in housing, and the second largest sector being credit unions. These cooperatives have a total of almost 5.6 million members with 21,670 jobs created. Total revenues, and wages and salaries created by the cooperatives in the state are $9.04 billion and $848 million, respectively. $100 million worth of land saved and retained (Zippert). Zippert also describes some of the intangible benefits from the cooperatives and the Federation/LAF’s support: the leadership growth of people, the changes in behavior that make collective decision making more effective, a greater appreciation of sharing by people as a means of working together economically in communities; and teaching people in co-ops how to make decisions about their collective well-being. Also see Federation of Southern Cooperatives/Land Assistance Fund 2007 and 2012. Borzaga, Carlo and Giulia Galera. 2012. Promoting the Understanding of Cooperatives for a better world. Summary, proceedings of “Promoting the Understanding of Cooperatives for a Better World” conference, sponsored by Euricse and International Cooperative Alliance, March 15 and 16, 2012, Venice Italy. September 28, Euricse. Retrieved from http://ica.coop/sites/default/files/media_items/Report_Venice2012_PRINT.pdf. Deller, S., Hoyt, A., Heuth, B and Sundaram-Stukel, R. 2009. “Research on the Economic Impact of Cooperatives.” June 19, 2009 update (from 2007). Madison, WI: University of Wisconsin Center for Cooperatives. Retrieved from http://reic.uwcc.wisc.edu/sites/all/REIC_FINAL.pdf. Fairbairn, Brett, June Bold, Murray Fulton, Lou Hammond Ketilson, and Daniel Ish. (1991). Cooperatives and Community Development: Economics in Social Perspective. Saskatoon, Saskatchewan: University of Saskatchewan, Centre for the Study of Co-operatives (revised 1995). Gordon Nembhard, Jessica. 2002. “Cooperatives and Wealth Accumulation: Preliminary Analysis.” American Economic Review 2 (May): 325–29. Gordon Nembhard, Jessica. 2004b. “Non-Traditional Analyses of Cooperative Economic Impacts: Preliminary Indicators and a Case Study.” Review of International Co-operation 97 (1): 6–21. Gordon Nembhard, Jessica. 2008a. “Asset Building Through Cooperative Business Ownership: Defining and Measuring Cooperative Economic Wealth.” Discussion Paper. Research on the Economic Impact of Cooperatives, University of Wisconsin Center for Cooperatives, December 1. Retreived from http://reic.uwcc.wisc.edu/discussion/papers/nembhard.pdf. Gordon Nembhard, Jessica. 2013. “Community Development Credit Unions: Securing and Protecting Assets in Black Communities.” Review of Black Political Economy Vol. 40 Issue 4(December), p 459-490. Gordon Nembhard, Jessica. 2014. 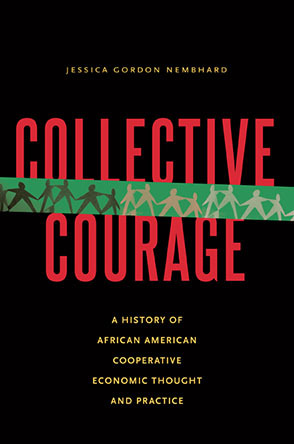 Collective Courage: A History of African American Cooperative Economic Thought and Practice. University Park, PA: Pennsylvania State University Press. Iowa Association of Electrical Co-ops. 2011. “Economic Impact study of Iowa’s Electric Cooperatives.” Iowa Rural Electric Co-ops. Retrieved from http://www.iowarec.org/media/cms/Iowa_Association_of_Electric_Cooper_BAB3A3A6D61EB.pdf. Press release: http://www.iowarec.org/economic-impact/. Logue, John, and Jacquelyn Yates. 2005. Productivity in Cooperatives and Worker-Owned Enterprises: Ownership and Participation Make a Difference! Geneva, Switzerland: International Labour Office. WAGES. No date. “Economic Empowerment.” Impact. Women’s Action to Gain Economic Security (Oakland, CA). Retrieved September 11. 2013 from http://www.wagescooperatives.org/economic-empowerment. Williams, Richard C. 2007. The Cooperative Movement: Globalization from Below. London: Ashgate Publishing Group. Yes! Magazine. 2013. How Cooperatives are Driving the New Economy. Yes! Issue 65 (Spring): 17-49. Zeuli, K. Freshwater, D. Markley, D and Barkley, D. 2003. “The Potential for Non-agricultural Cooperatives in Rural Areas.” University of Wisconsin Center for Cooperatives publications. www.uwcc.wisc.edu/info/uwcc_pubs/zeuli_01_03.pdf. Zeuli, K. Freshwater, D. Markley, D and Barkley, D. 2003. “Non-agricultural Cooperatives in Rural Areas: Fourteen case studies”. University of Wisconsin- Extension June 2003 Case Study #1, June. Retrieved from http://community-wealth.org/sites/clone.community-wealth.org/files/downloads/paper-Zeuli-et-al.pdf. Ziewacz, Judy. 1994. “Cooperatives as Economic Development Tools.” American Cooperation annual, p 189-193. Jessica Gordon Nembhard is a political economist and Associate Professor of Community Justice and Social Economic Development in the Africana Studies Department at John Jay College, City University of NY; and author of Collective Courage: A History of African American Cooperative Economic Thought and Practice. An affiliate scholar with the Centre for the Study of Co-operatives, University of Saskatchewan, Canada, she is a member of the GEO Collective, as well as the US Federation of Worker Cooperatives, the Eastern Conference for Workplace Democracy, the Southern Grassroots Economies Project, and the US Solidarity Economy Network. Gordon Nembhard is also a member of the Shared Leadership Team of Organizing Neighborhood Equity (ONE) DC (a community organizing organization in Washington, DC). Jessica is the proud mother of Susan and Stephen, and the grandmother of Stephon Nembhard.